The front steek of "Marina" is finally crocheted. It took two hours and my hands ached afterwards but it is done. Have to see if I machine sew the sleeve and neck steeks or crochet them. The photo shows the steek at the V neck of "Marina". The darker two vertical lines of turquoise are the crochet lines. Unfortunately the photo also shows that somehow I am a stitch off on the left side of being symmetrical. 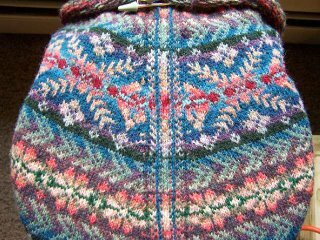 It also could be just the way the stitches are lying before blocking as close exam doesn't show an error, just in the photo?? 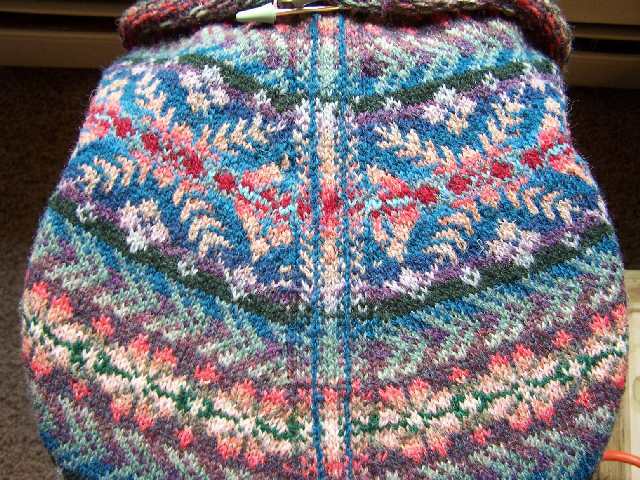 I want to get the three needle shoulder bind off done and then work a while on the "Beadwork" sweater. That one is on the needles with the bottom diamond band done and the pattern set correctly for working in the round. It will be so odd to work with only one color. The quilt photo is of a large lap quilt just back from Virginia Anne Quilts, a local woman who does excellent machine quilting. My hand quilting was never very good and I could never do it now with these aging hands that may be getting arthritis. The quilt is a recreation of the center of a king size wedding quilt made for my brother and sister in law 15 years ago. I even found enough of the exact same fabrics in the quilt fabric stash to make the lap size. 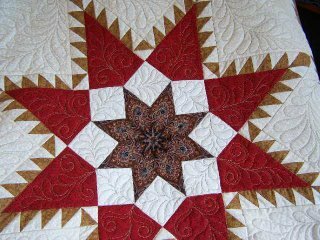 The pattern is "Paramount Stars" by Mary Kay Ryan of Vermont. Excellent pattern and involved but not difficult. It is so pretty I'm toying with making a large one for us in blues. Think I'd better live to be 110 to finish all I want to do. Retirement sure is a joy especially now that all the gardens are put to bed for the winter and I never do much housework anyway. Marina is so beautiful! I can't wait to see how she turns out. Both the "Paramount Stars" quilt and Marina look terrific. It is nice seeing the re-created quilt completed.